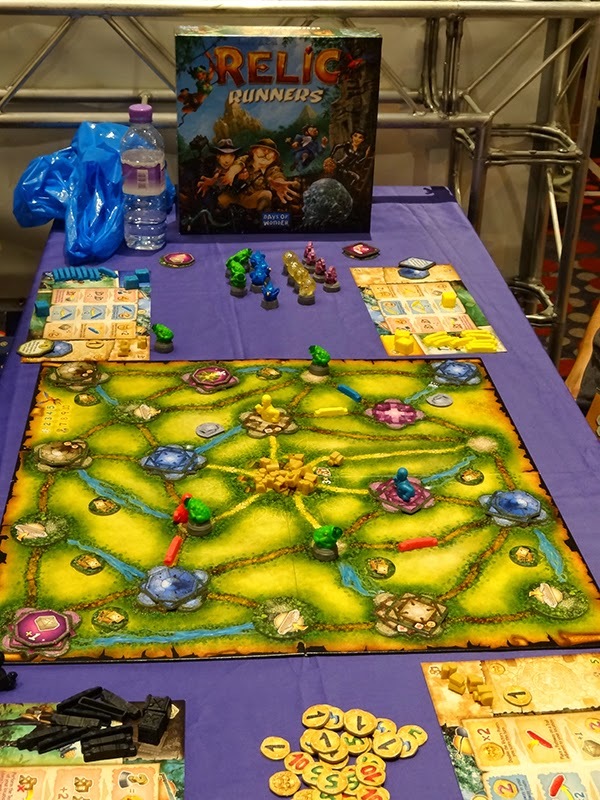 The UK Games Expo 2014 was held over the weekend of May 30th - 1st June at Birmingham's Hilton Metropole Hotel near the NEC. 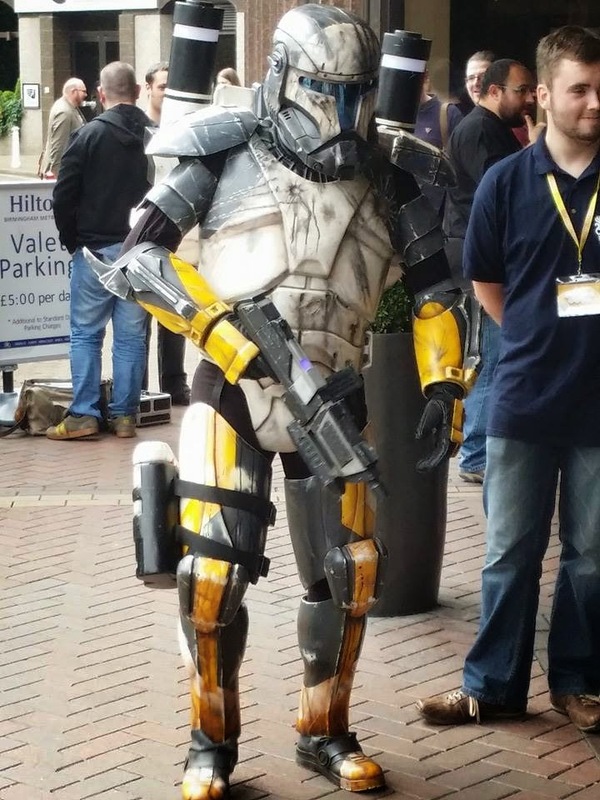 I attended and had a great time last year, so this year I was obviously going to be drawing some comparisons. 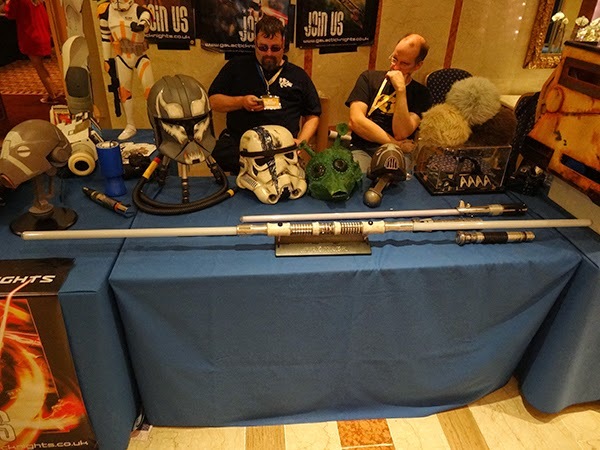 I travelled to the event from Cornwall (home of Grublin Games, /plug) with two friends. Not a bad trip up, but plagued by endless roadwork sections with 50mph limits and no roadworks actually going on. There is a rule I believe about "Not touching a black mans stereo" but when that black man is playing One Direction and laughing like a maniac, you have to be a rulebreaker...Shame I didn't have a hammer. We stayed at the Premier Inn not far from the venue and it was a great hotel. Recommended. I was quick to commandeer the King Size bed while the other two losers got the single beds. Happy days. The parking was annoying. We got told to use some distant North carpark which was free and there would be a shuttle bus. We did this, but a sign said the bus was not running!! So we found a much closer car park for free as well. Guests at the Hilton attending the event received a discount on the parking also. Very commendable! It certainly felt like a bigger event than last year! 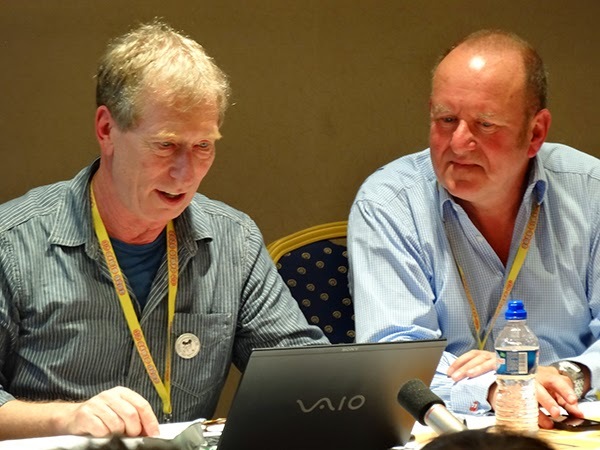 There were a lot more people attending and the venue's air conditioning struggled in some of the smaller rooms, particularly where the seminars were being held. MANY cider breaks were needed! If you want to play new games and meet lots of people in the process, this is the event to attend for sure. The food court was a major issue last year, with people having to sit on the floor and eat. This year was much better with plenty of dining tables and...chairs!! Proper cutlery was also provided and the hall was always open. Food prices were much the same as last year and drinks were discounted with beer at a reasonable price and actually cheaper than my local! The menu was very similiar to last year, not a problem for me and I thought the quality of the food was good provided you ate when it was freshly put out. The staff were friendly and the service was very good I thought. The only issue was Saturday night at the main bar which was seriously under staffed with a long waiting time. 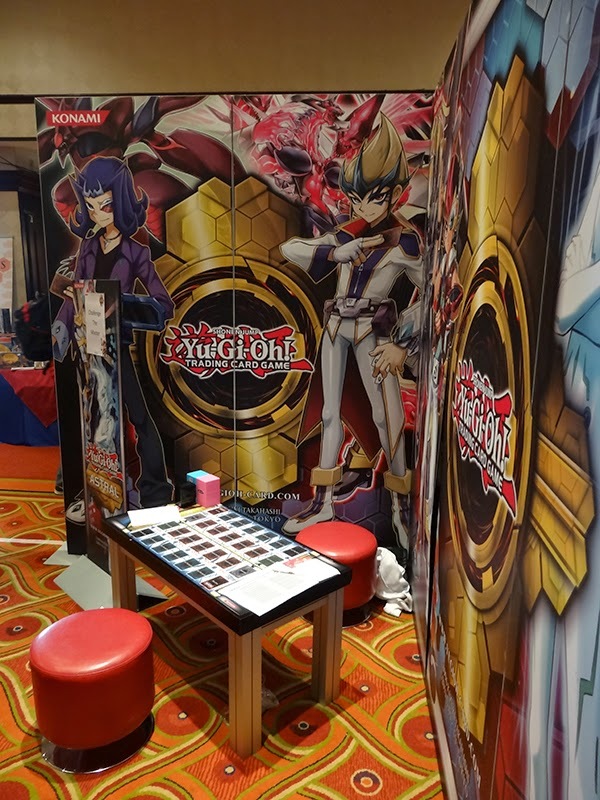 The event was well laid out, better than last year, cosplayers in the foyer, lots of free gaming space, trade space and tournament space. I don't think any complaints can be made about the arrangement of everything. 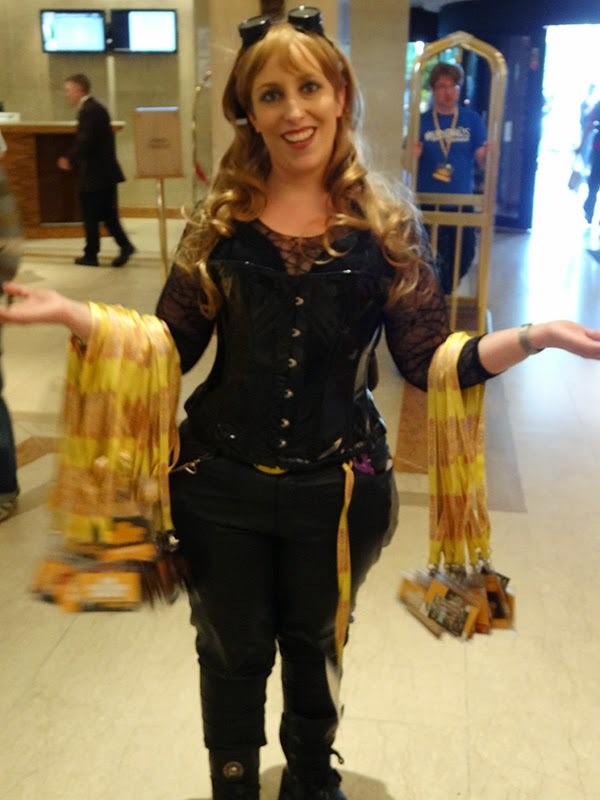 So to the organisers, a big thank you for making things better than last year! 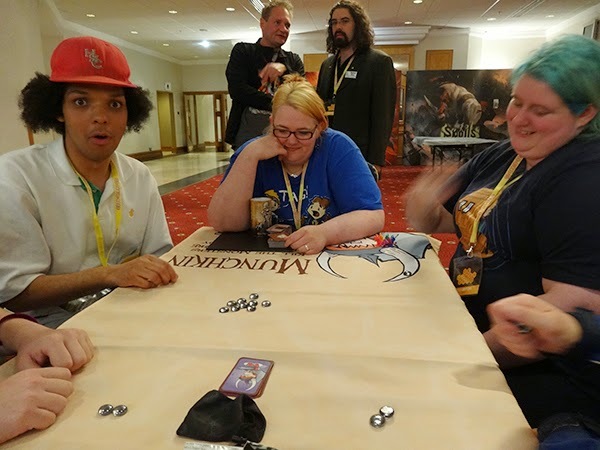 "Team Awesome" at the Pandemic - The Cure tournament. 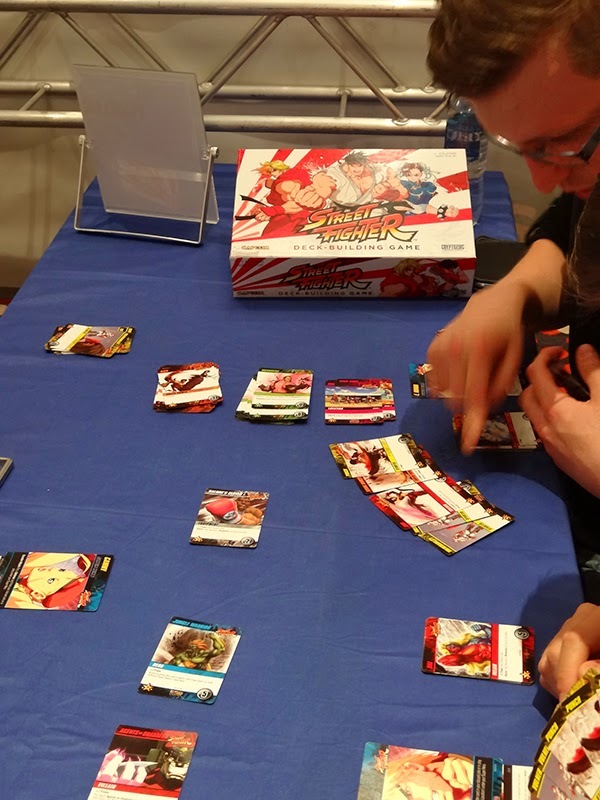 Came 2nd, so maybe Team "Nearly Awesome"
The Game setup, Nice and simple with some cards that you can buy to add effects and bonuses. The Bring and Buy sale this year was quite crazy. 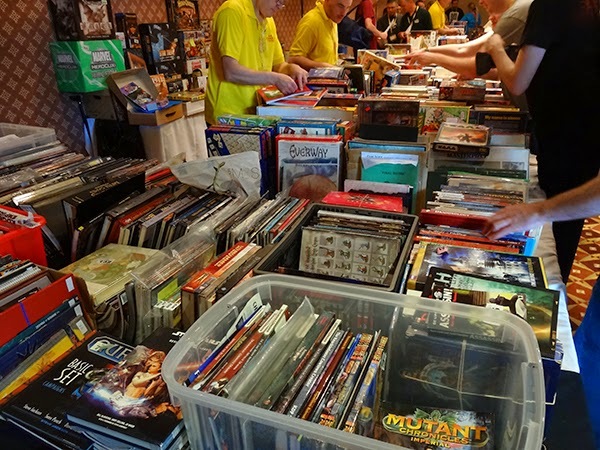 Whilst Friday was busy, it was certainly possible to drop your games in and have a good browse. Saturday and Sunday however, had people queuing out of the door! Very busy indeed. I picked up a few bargains, Discworld GURPs being my favourite purchase for a mere £5. The Bring and Buy sale charges a 10% commission which gets donated to the Addenbrookes Charitable Trust, Heartline and Cancer research UK. Some very worthy causes. After a hard days gaming and routing through the Bring and Buy I was ready for some cider. 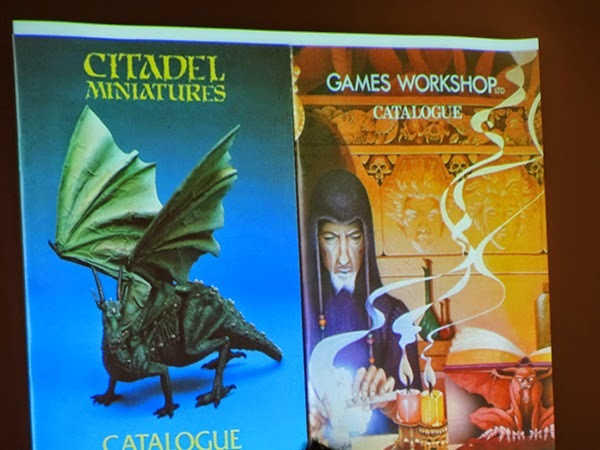 The show in it's entirety was open today and my own day was going to be mainly seminars - most importantly Steve Jackson and Ian Livingstone's seminar, the guys who got me into all this stuff! 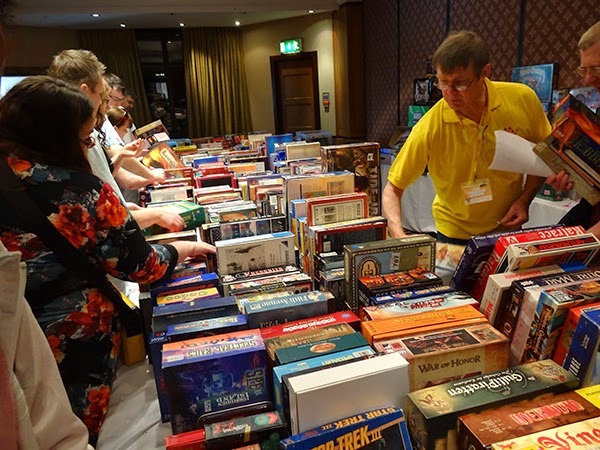 The traders hall had a vast selection of games and associated products, both secondhand and brand new of course. 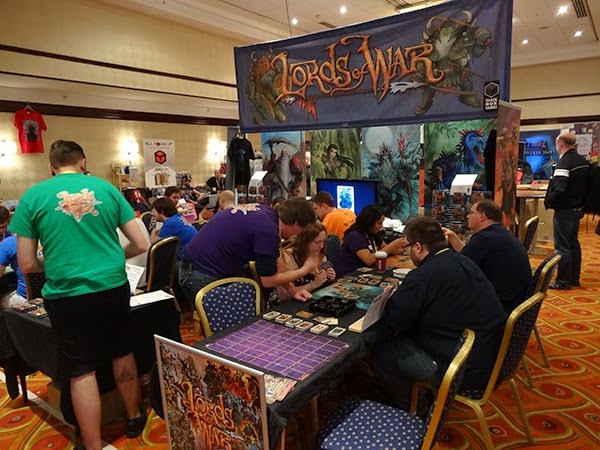 The show has it all going on today, tournaments for Catan, Warmachine and other games, RPG gaming in 7 of the hotels rooms, Playtesting for new games still at prototype stage, a kids games room. There is lots to do for everyone and I'm not sure I could think of anything it's missing to be honest. It was 09.27am when I took this picture. 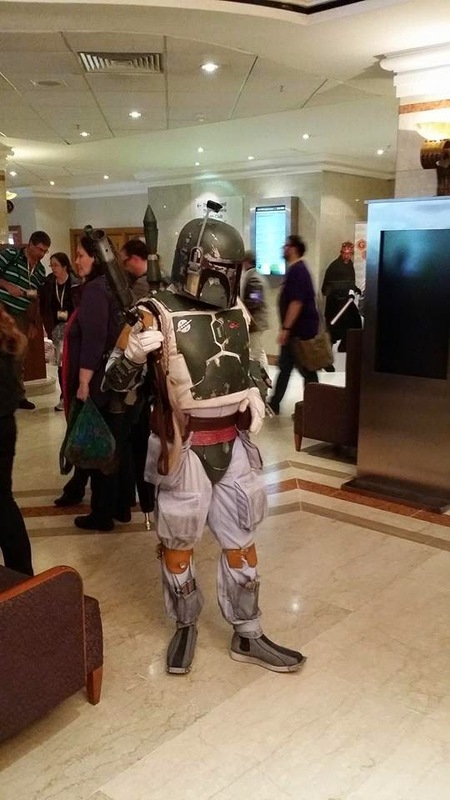 Is that not too early to be hunting for Jedi? 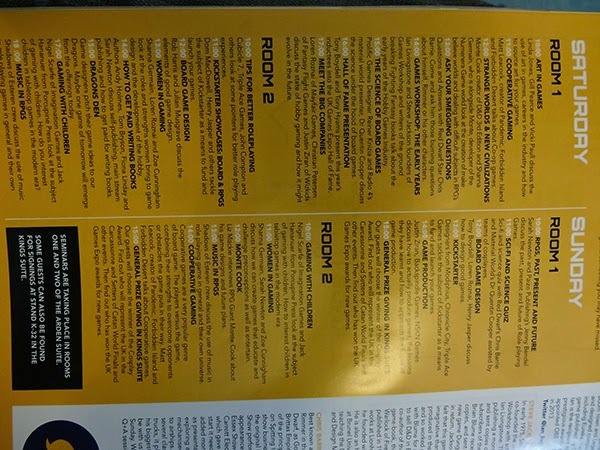 Too many traders to list here but good to see a lot of home grown products from art to dice bags to homegrown games, it's not all large, world dominating games companies products in here!! 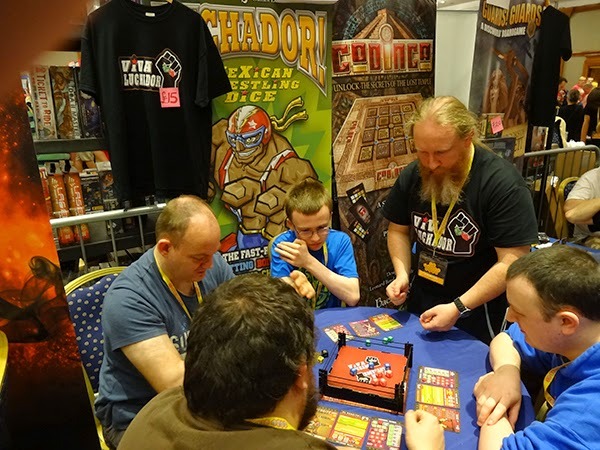 One example of this is Cornish games company, Grublin. 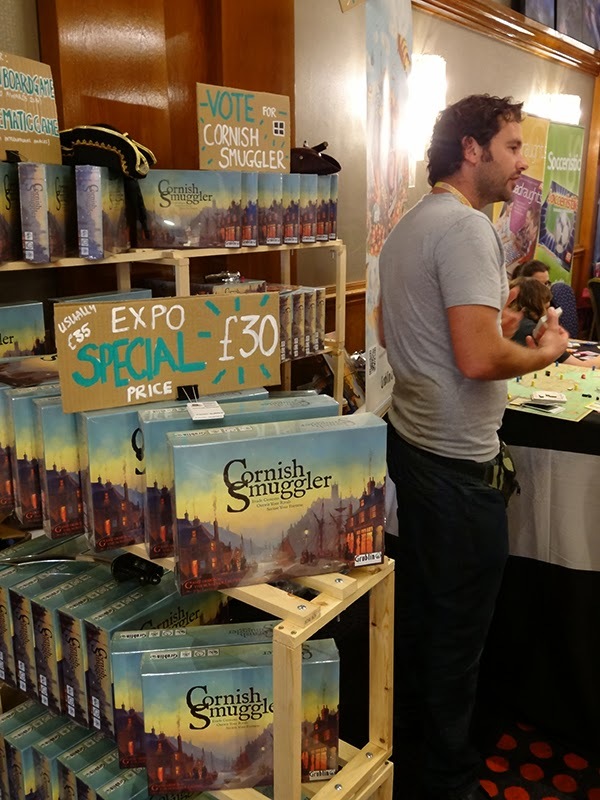 They had a very successful Kickstarter campaign for their game "Cornish Smuggler". 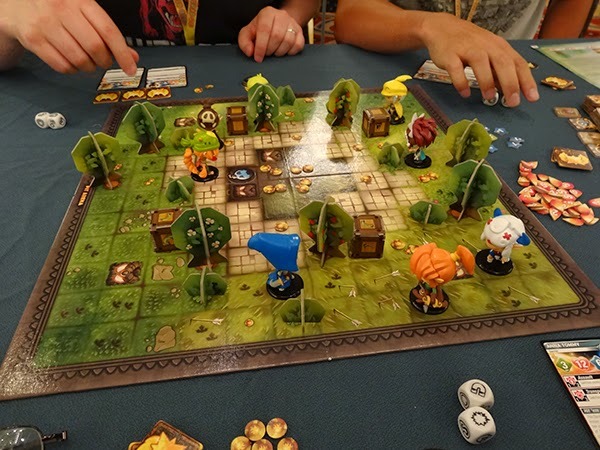 The game has done well and was released at Essen last year. 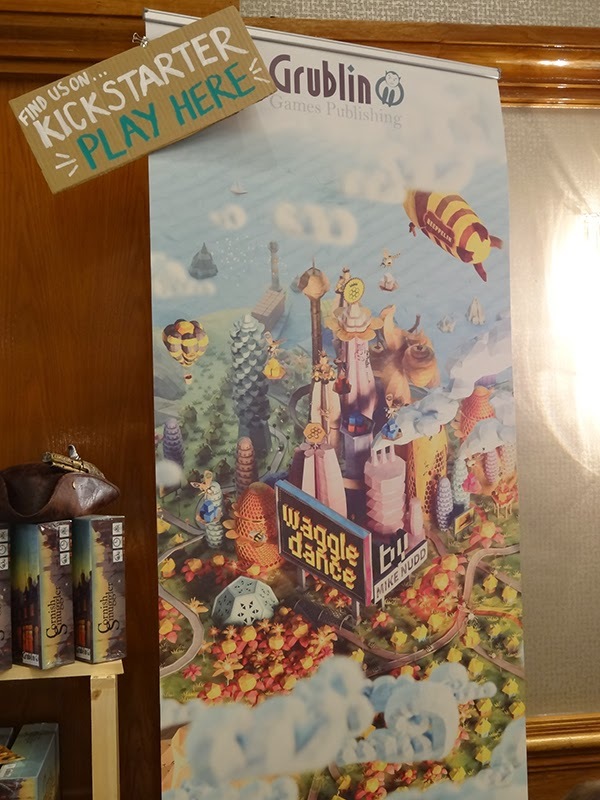 They now have something else in the pipeline, a new Kickstarter for a new game - Waggle Dance, so please check it out and show some love for the indie guys out there, wherever they may be! Dice games are becoming popular in our games club. 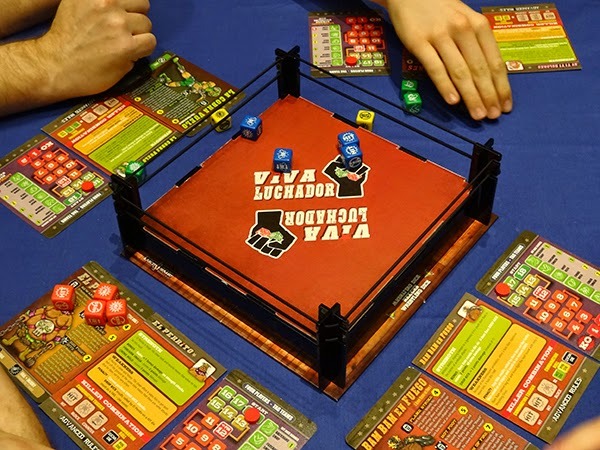 Luchador is a wrestling themed one which currently has a Kickstarter going for its second edition. Check it out HERE. 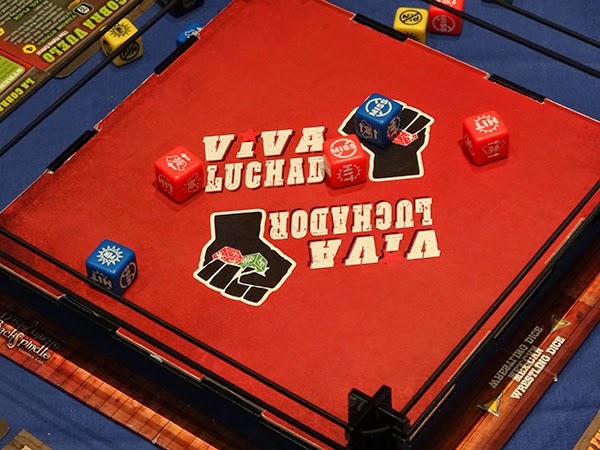 Luchador Mexican Wrestling Dice Game!! 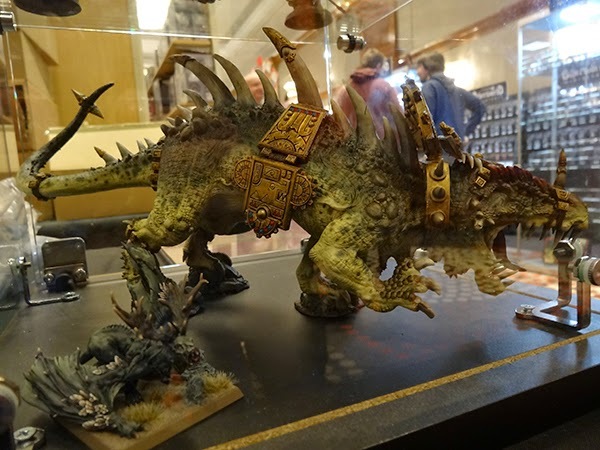 The mighty Forgeworld were there with some awesome models. 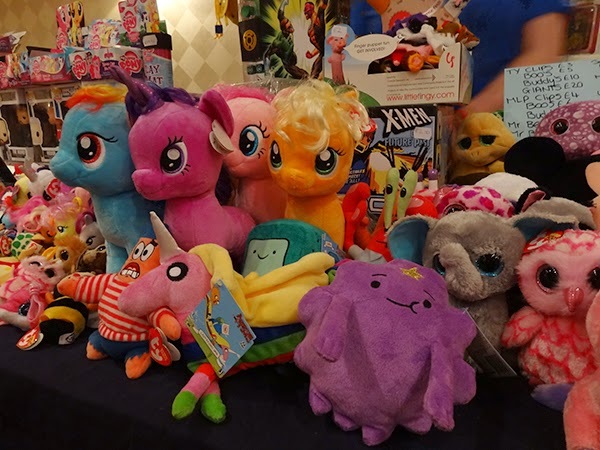 When I took this picture the room went funny and eerie music started to play in my head - "La La--La La...." I suddenly felt very small and all the toys started to walk towards me - SCARY......or I drank too much cider. 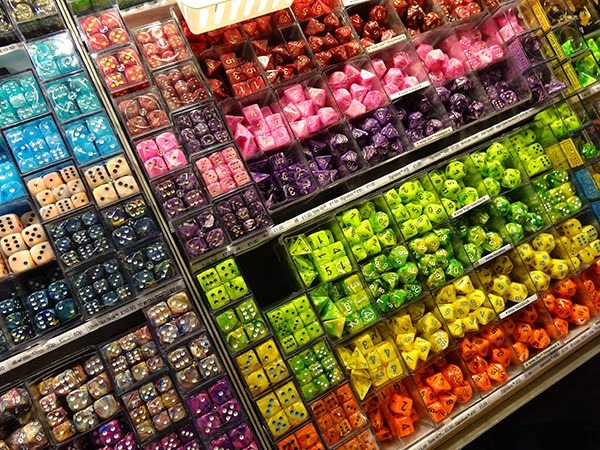 These guys had more dice than you could shake some dice at. This old boy was awesome. He was taking out everyone pulling that suitcase around and smashing it into them. Me, my mate. Get in his way - BOOM! Down you go sucker. There was an interesting and day filled schedule for seminars. 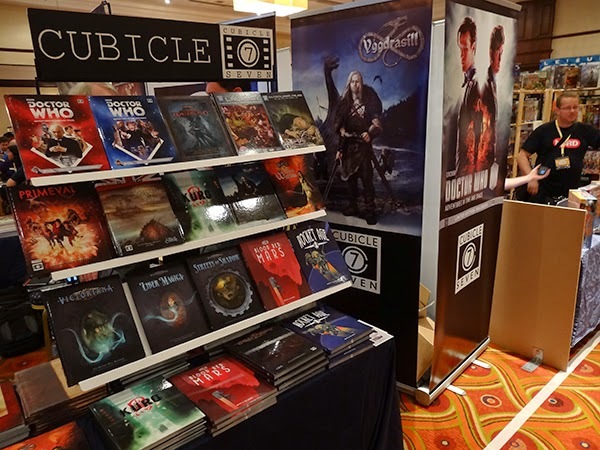 These were held in two rooms over the two days and covered many topics from running Kickstarters to games design, women in games, music, art, the future of RPG's. 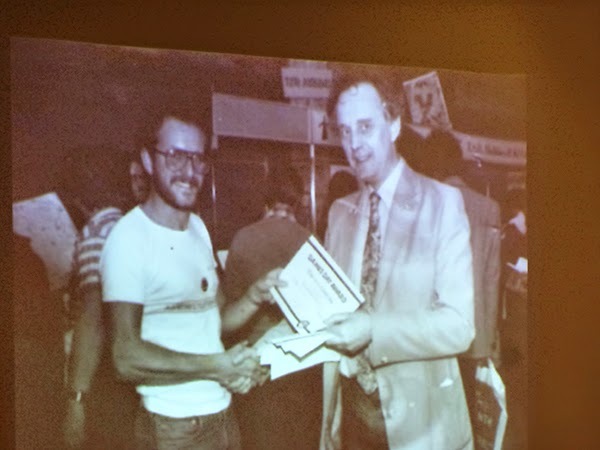 An impressive list with highlights, for me at least being a talk by Chris Barrie of Red Dwarf and Brittas Empire fame and a talk on the early days of Games Workshop with Steve Jackson and Ian Livingstone. Chris Barrie was very amusing to listen to, unfortunately I got no pictures, as I forgot to charge my batter...I mean, something wrong with camera and stupid technology, etc. He talked about his career, did some impressions, talked about production process of Red Dwarf and took questions. He even hung out at the bar in the evening and talked with everyone. 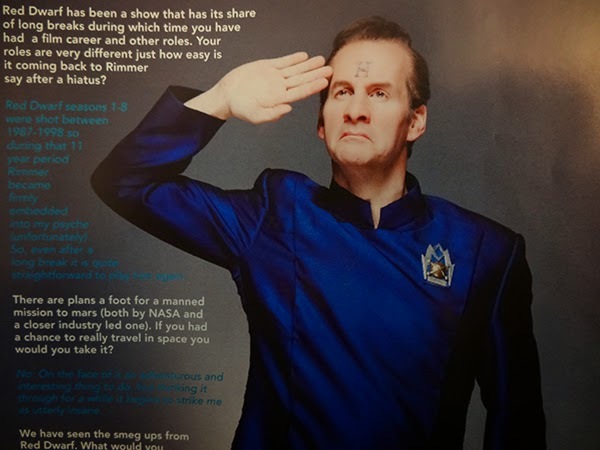 Rimmer is such a Smeghead! 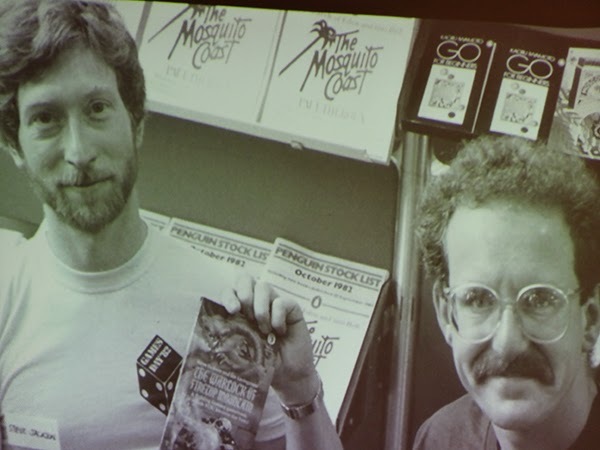 Steve Jackson and Ian Livingstone are two of my favourite games industry personalities. 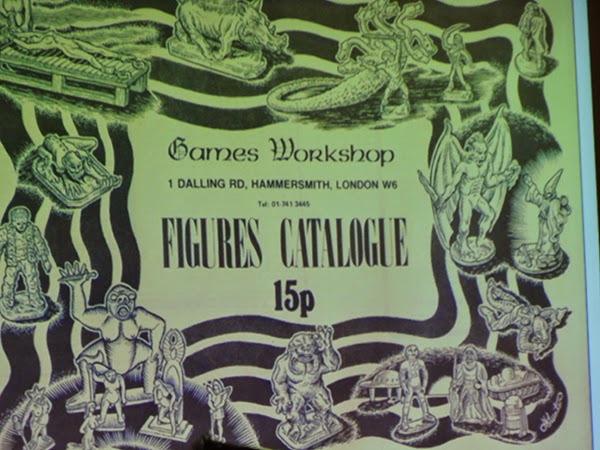 They brought D&D to the UK, produced the Fighting Fantasy game books and created Games Workshop. 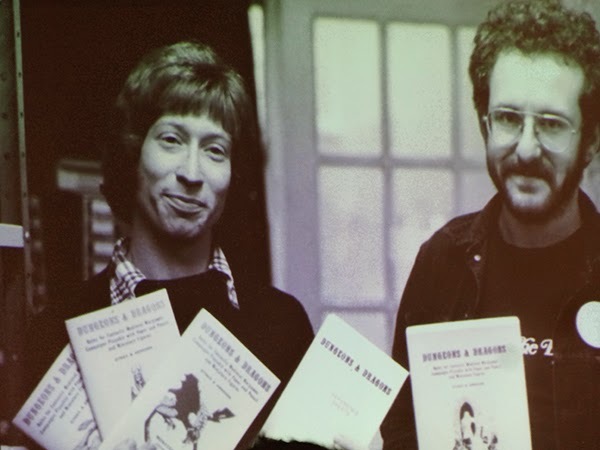 Steve and Ian showed a series of old photos and gave a talk about the early days of the company and their careers since. 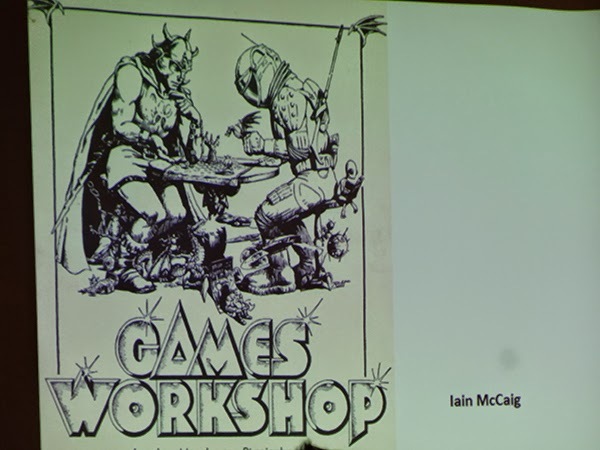 They announced plans for some resin kits of characters and monsters from the Fighting Fantasy series designed for painters. 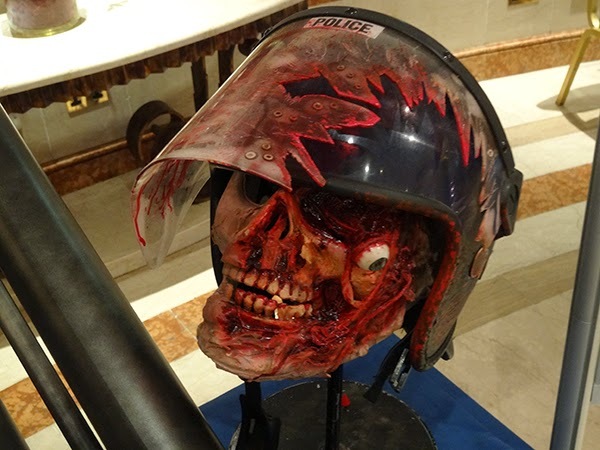 This project is still in the pipeline but some of the figures were shown to the audience. Steve and Ian also did a book signing after the talk and I got some of my stuff scribbled on and had a quick chat with Ian Livingstone. A proper catalogue with a proper price. 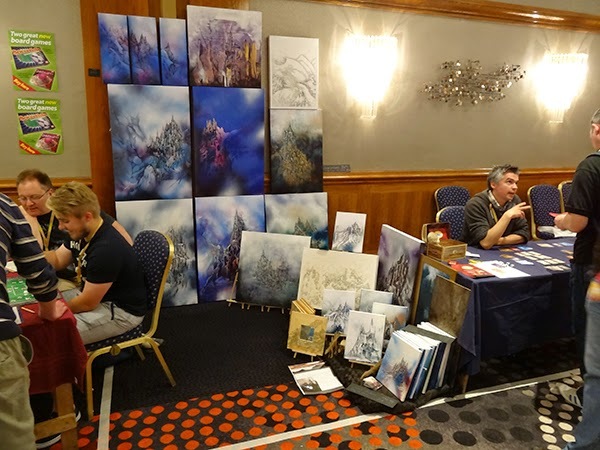 Iain McCaig is an awesome artist. 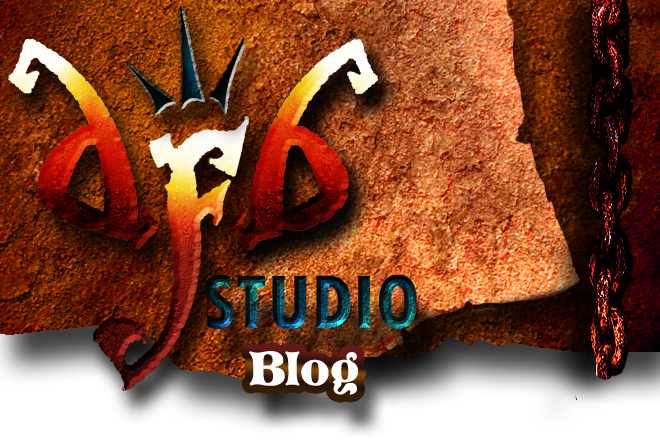 One of the first logo designs. Here is TALISMAN!! 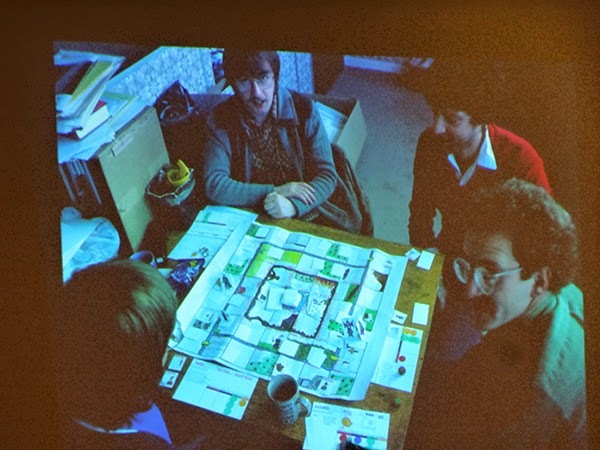 Bob Harris shows his prototype game to Steve and Ian. I am the proud owner of the original art for the 4th Revised Edition Talisman board. And NO, it's not for sale! Competition entries to choose the name of the company Steve and Ian were creating! 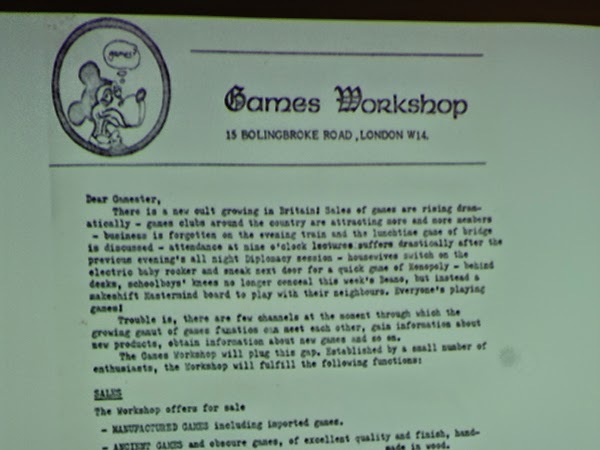 There was plenty of space for people to bring their own games in and play with anyone and everyone. But there were also demo games set up near the trade area for people to come along and have a go at. 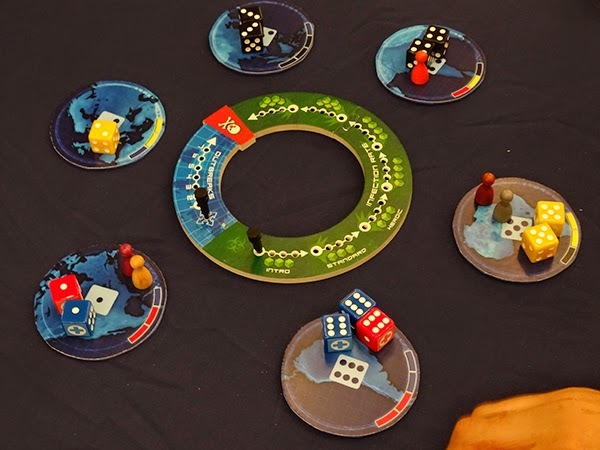 Too many to list them all, so I took a few photos of games in progress. If you don't have many games of your own then these demo games are great. 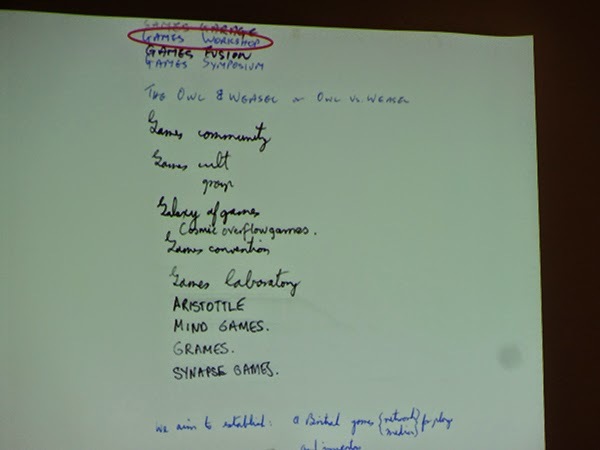 A games library is also in operation where you can sign out games from the collection of the expo organisation and go and play. 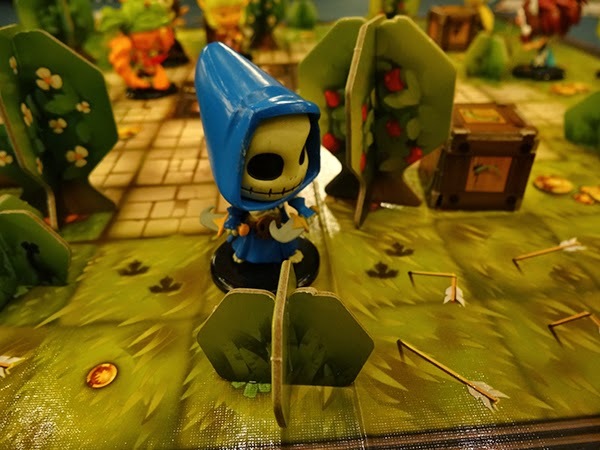 Arena, wasn't keen on this game, but I did like the idea and the little characters were pretty cool! Cthulu Dice. I didn't join in this one as I had already played it more than enough over the previous week. 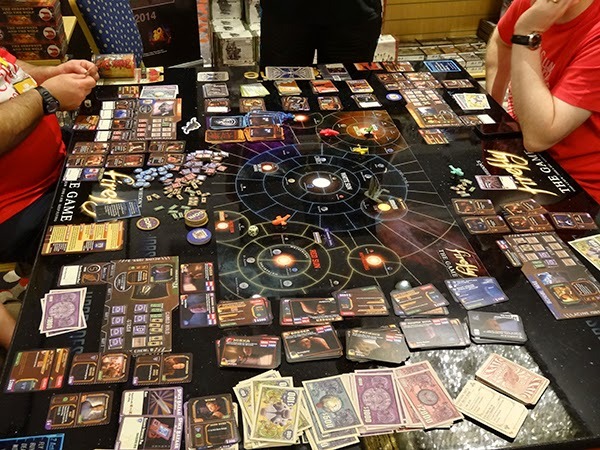 Firefly is a pretty good game! 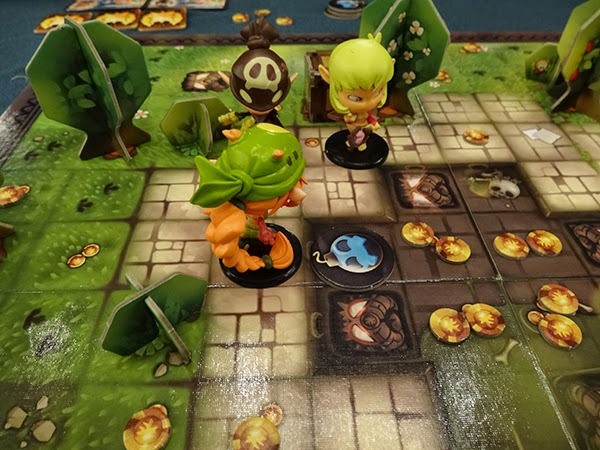 Boss Monster, nice little card game. So that was pretty much it. 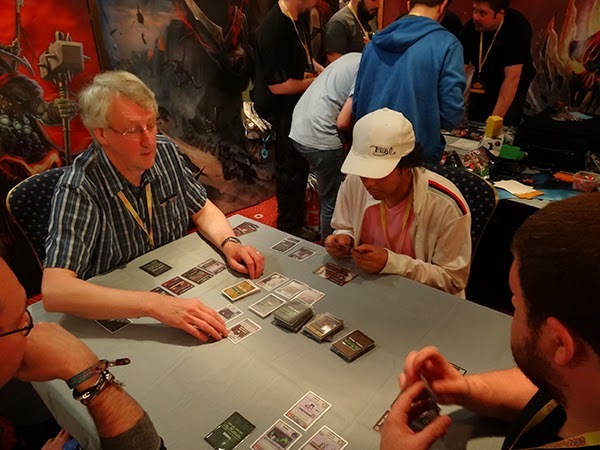 I took part in a Dominion tournament on the Sunday. 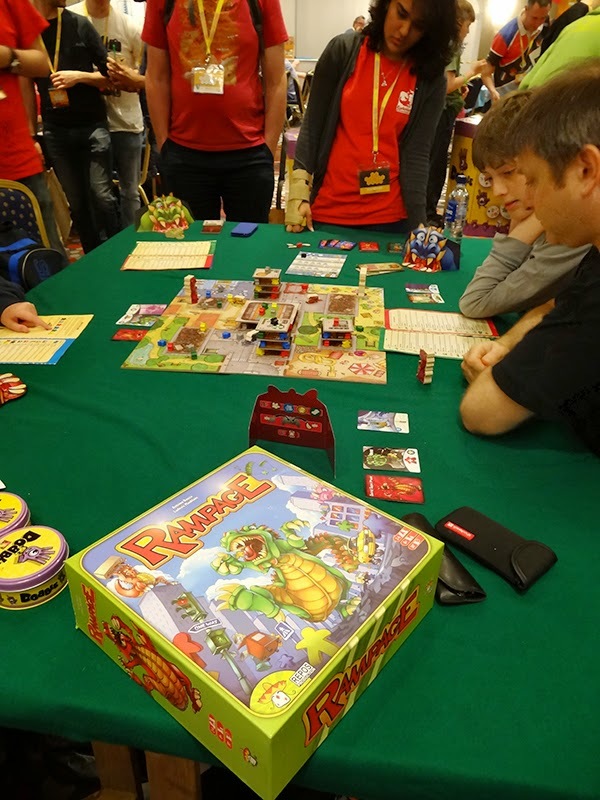 A little disorganised to begin with as they had only sourced one copy of the game! But thankfully it got sorted out fairly swiftly and we were able to get on with it. Personally, I think we could have done without the break and just run it and finished it after lunch. Starting it at 1 or 1.30pm would have been better. 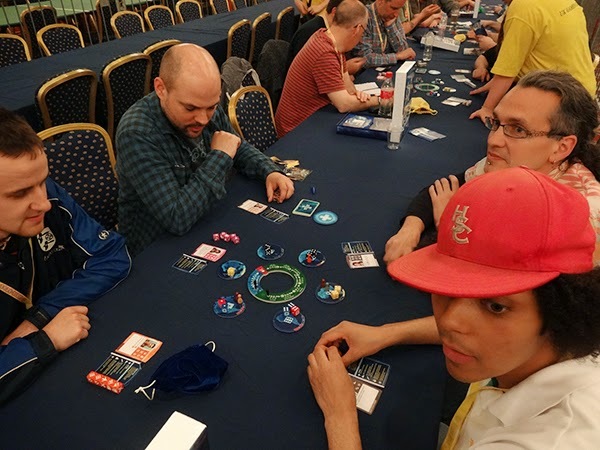 I didn't do well, getting a 4th, 2nd, 2nd (1 point off first) in my games, but I did enjoy playing and it was nice meeting new people! Also got a chance to catch up with some people I met last year. We had an interesting game of Talisman late into the night where I was totally robbed and mercilessly hounded by dark sorcery. Thats my excuse anyway!! Looking forward to next years already. 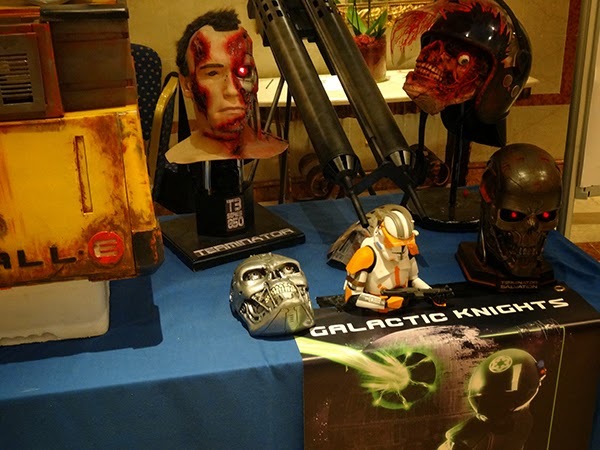 If you haven't been to this event before and are a gamer, I would recommend you come next year! "Give me that lanyard! Or I will look for you, I will find you and I will kill you!"